The starting point for Mustcare Pro was our own search for a complement to the rehabilitation of one of our horses, Pop Non Stop. For us, “Pop” has always been a very special horse and with his big body and his nice, gentle personality, he walks straight into the heart of almost everyone he meets. When our Pop was injured five years ago, we searched high and low for something that could effectively support and help his rehabilitation – What we found laid the foundation for Mustcare Pro. Pop is our own breeding and is after Non Stop R. We have also had the privilege of owning both his mother and grandmother. Already very young, Pop was tall with long legs and a lot of body. He was far from the prettiest young horse but definitely the kindest one can imagine. Pop did not seem to stop growing and when he measured 180 cm at the age of 4, we simply stopped measuring. Pop has always shown a lot of capacity as show jumping horse, there has never been any doubt about his talent. Pop is not the bravest or toughest horse but his heart is of gold and at least as big as his body. Pop simply there for his rider and does his utmost for the people he sees as his. An amazing horse to own, work with and develop. When Pop was 5 years old, he had an accident, it all went very fast and was quite undramatic. Pop slipped with rider on some snow covered ice on his way to the riding arena. Pop fell, and although he was both sound and looked alright, it was not really the same horse afterwards. He simply was not completely the same but it was difficult to put the finger exactly on what it was. We examined Pop in every possible way with veterinarians as well as chiropractors, but nobody could find anything. But after a while, a small front leg lameness developed which led to treatment and a longer rest. But instead of getting better, Pop gradually became worse from being off work. He also lost muscles on his right shoulder. A new examination showed that the deep ligament that attaches to the shoulder from the chest was damaged. The deeper ligament was partially healed but inelastic scarring had formed. This was the beginning of a long rehabilitation period. Pop is a large horse with a lot of mass and to heal completely and to maintain mobility and elasticity in the ligament, he needed be under movement. Water therapy was the best option because it was also very important that Pop used both front legs equally. During this period we also searched for something that could help and support the healing and complement the physical rehabilitation work. The water therapy slowly helped Pop, but the real turn came when we began to supplement with a mixture of anti-inflammatory and healing herbs in combination with MSM. We could quickly see a generally improved pattern of movement and the results of the progressively increased exercise came both faster and was better. As a bonus, the herb mixture also gave a shinier coat, improved hoof quality and an overall happier horse. 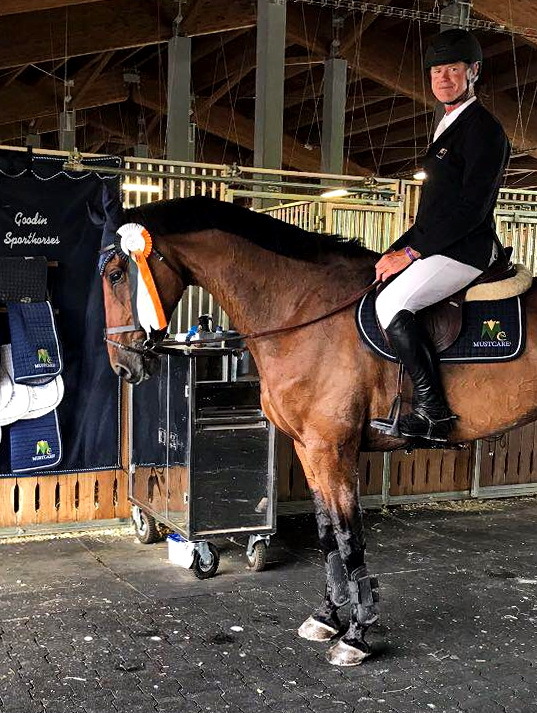 To see how effective the herbal mix helped Pop from having a future as a company horse to take his first jumps under rider after the accident was the starting point for Mustcare Pro. Today the herbal mix is sold as one of our supplements – Fenilpro. After rehabilitation and during a start-up period of two years, Pop has continued to eat Fenilpro. Pop is now 10 years old and both stronger and healthier than ever before. We are extremely proud of Pop, which has debuted internationally 145 cm during the summer with Bruce Goodin, something that nobody thought was possible five years ago. We are extremely grateful that our precious Pop Non Stop has been able to return and has the possiblity to show his capacity. And, of course, we think it’s great that we are able to offer other horse owners the same support for their horses.